A particularly choice quote form Ricardo Elia. Nothing new here, just a general run down of a few cases as part of the Woman in Gold hype. The Meidum Geese. We’ll see. Tillmann was sentenced to nine years in 2013 and returning all of the stolen material he had has been difficult. Heritage professionals and volunteers are monitoring 500 archaeological sites in Lambayeque to stave off traditional Easter Week tomb robbing. As usual I say ‘how are you going to prove it came from Iraq or Syria” and ‘how are you going to prove it came post ISIS’? Has to be said after poor reporting on the part of Breitbart (expected) and ArtInfo who picked up the false story. Sea Hunters LP is no longer able to ‘salvage’ the S.S. Port Nicholson after a criminal investigation and allegations of fraud form investors. Sorry Norton Simon, as the judge said: “Stolen property remains stolen property, no matter how many years have transpired from the date of the theft”. 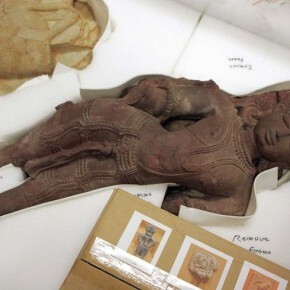 Nayef Homsi, a Manhattan dealer, appears to be going down for selling looted Indian and Nepali sculptures. More detail on the Nayef Homsi charges. The sales occurred in 2012 and 2013 and at least one of the pieces was stolen from the Itum Bahal Temple in Kathmandu in 1983 and Homsi apparently said he was too nervous to search the Art Loss Register. More Kapoor loot falls. The museum has several other pieces bought from Kapoor but those appear to be okay. Klaus Albrecht Schröder, the director of Vienna’s Albertina Museum. ‘La Seine vue du Pont-Neuf, au fond le Louvre’ was determined to be looted during WW2 and will be returned to heirs. The Hague Forest with a view to Huis ten Bosch Palace, by Joris van der Haagen will be returned to heirs following a provenance inquest led by Queen Máxima. The venerated image of the Virgin del Cristal was stolen and a priest was murdered at Vilanova dos Infantes, Orense. The church of Villanueva de los Infantes in Orense is considering making a replica of the image of the Virgin that was stolen last month. A priest was killed during the theft. Sekhemka isn’t going anywhere fast. Everyone went to the BM to see the statue which experts displayed had clear signs of being recently excavated. The case belongs to the designer of the Spitfire and was stolen last month. Returned inside a padded postal bag. The letter was written jointly by the residents of Datian County in Fuijan and overseas supporters. A short piece about the stolen mummy-in-a-statue. It credits Lin Yongtun of Yangchun with making the ID of the stolen piece. A short article about the stolen idol market in Bangalore with a few cases listed. By Hugh Eakin. I will say again, we kill and die to protect lives and that should come first. No one should be sent to die for archaeology. No one should kill for it. The book, a record of a Prague Jewish Community, was stolen from a synagog inside a Jewish museum in 2007. It was found in a private home in Petah Tikva. Arrests were made. Yes, selling fake artefacts as real is fraud. Very cool stuff from Dr Morag Kersel’s ‘Follow the Post’ project. Basically they are trying not to be another 2003 Baghdad Museum though, of course, museum workers there prepared too.